Our subconscious every night has a life of its own, creating magical worlds, weird visions and sometimes psychic premonitions. At times we wake up with the residue of a vivid world that felt real and confusion sets in when we realize it was "just a dream". Or was it? Some ancient cultures believe that what we think is reality is actually a fantasy, a dream. Talking animals, turbulent seas and hidden messages may color our nightscape, revealing the depths of our hearts and mind. 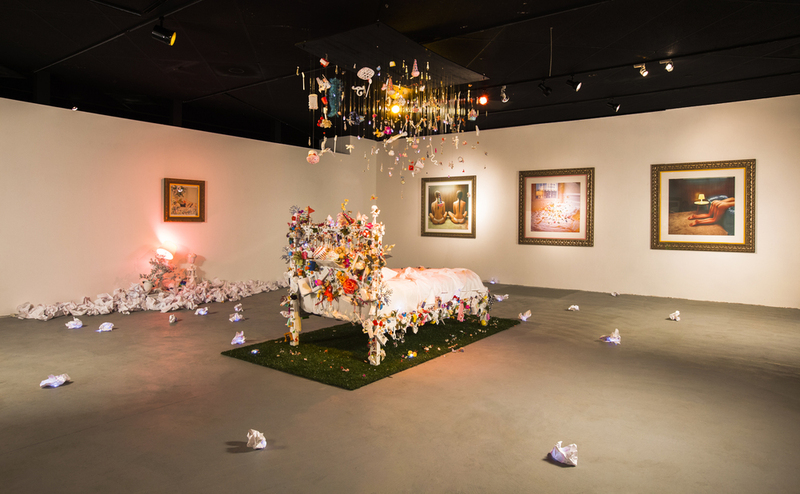 THE DREAM BED installation is a dialogue about what is real and what is fantasy. A bed covered in creatures, random objects and beautiful flowers represents pieces of our fragmented beliefs of what is real. Crumpled papers filled with the dreams of individual people cover the space, ready to be opened, read and crumpled again to return to the void of nothingness.